Check out this Oakwood Country Club home on a premium golf course lot at 24725 S. Golfview Drive! Be one of the first to see this expanded Oakmont (1800 sq ft) on a premium golf course lot with double fairway and water views! 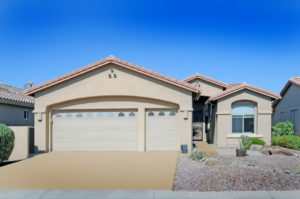 Close to the clubhouse, and barely lived in, this home features tile throughout with hardwood flooring in the master suite and carpet in the guest bedroom. Enter to the enlarged, great room with dining area and large picture windows offering stunning views of the golf course (Palms #9) and tranquil water views too. You will LOVE this kitchen with 42” cherry wood cabinets, granite counters, and an eat-in kitchen area with breakfast bar. A 2013 addition to the Master Suite offers a spacious sitting area, office or hobby room. Plus, your master suite includes a walk in closet, dual vanities, walk-in shower and a separate water closet. Guests will appreciate the split bedroom floor plan with nearby, guest bath. 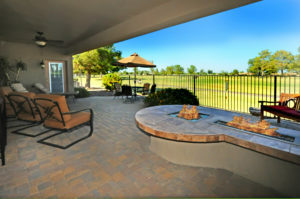 And, when chilly winter nights approach, relax on the covered and extended patio with a built-in firepit. There is plenty of room to lounge, entertain or watch the golfers. In addition, you’ll find lot of storage in the cherry wood cabinets, and a utility sink in the laundry room. The 2 car PLUS golf cart garage has attached storage cabinets and an epoxy floor. Soft water and RO are included, and the driveway has been grinded and re-coated October 2017. This Oakwood Country Club home is truly move-in ready and offers resort amenities. 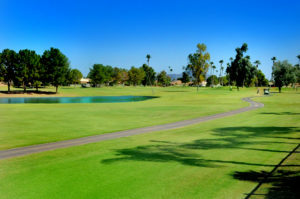 Take a golf cart or short walk to the Clubhouse where you find restaurants, a bar, the Pro Shop, a golf practice range, 27 holes of golf, tennis and pickle ball courts, a fitness center, and the Poolside Café for “grab and go” items and card-playing activities. There is also a heated pool and spa, a clubhouse rec room, and biking and walking paths. You’ll enjoy a gated community with an on-site guard and concierge too. Call us now to get more information at (480) 440-0849, or contact us here.